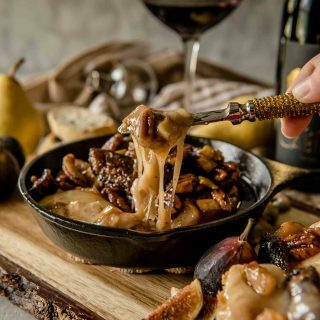 This creamy Brown Butter Fig & Pear Baked Brie is both elegant and comforting, and is sure to be the hit of any holiday or cold weather party! 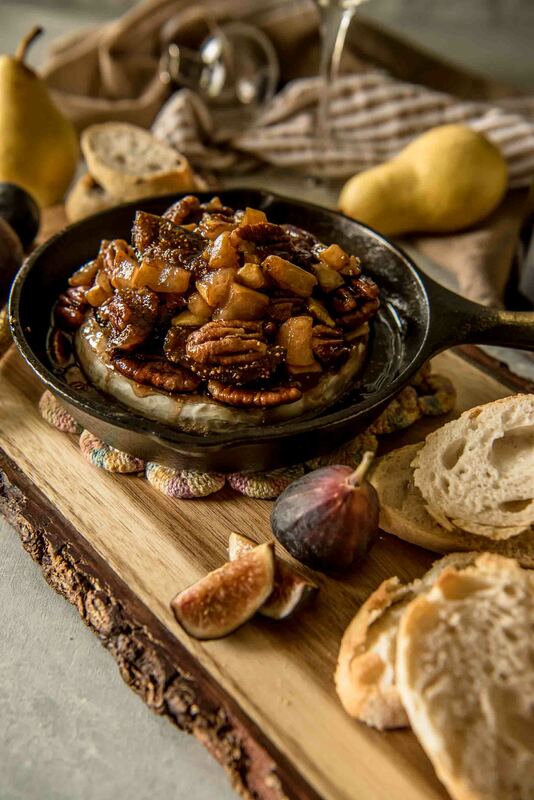 Figs, pears, pecans, and a little sweetness bring out the best in your favorite soft cheese. Would you believe if I told you I’ve never been a big brie fan? I know, I know. It’s probably not surprising, considering my thumbs down track record with goat cheese and those repulsive moldy blue crumbles. For the record, people’s taste buds do change. While brie might still not rank up there with cheddar, Havarti, or manchego…if I eat it smeared on crusty bread, smothered in autumn goodness like this, my feelings are bound to soften. Just a bit. 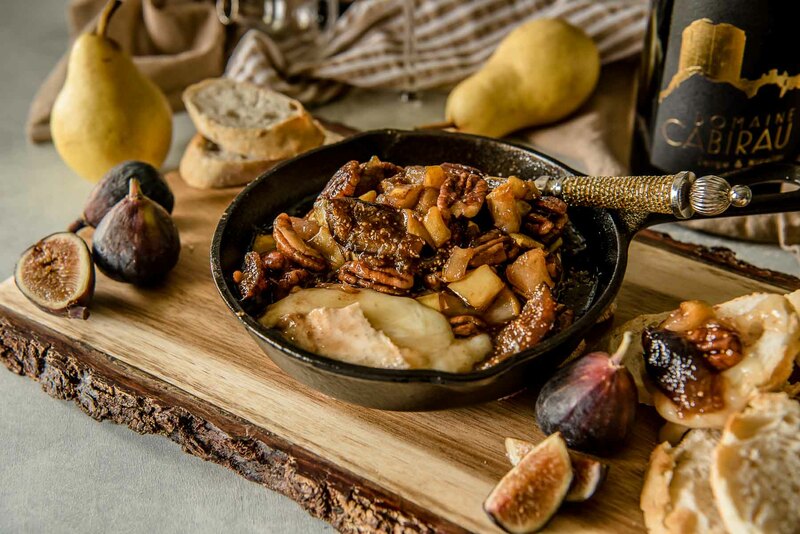 JUST TAKE ME TO THE BROWN BUTTER FIG & PEAR BAKED BRIE ALREADY! 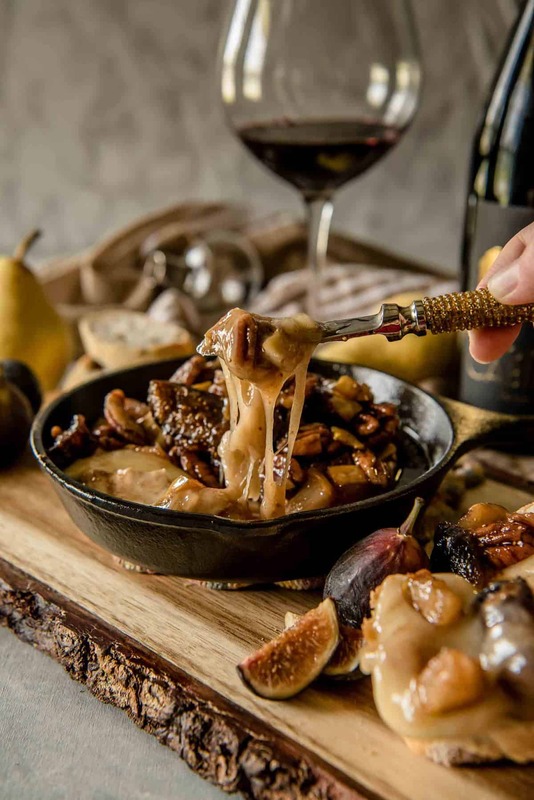 If you’d rather skip my (pretty darn helpful) tips and tricks, essential cooking info, and similar recipe ideas – and get straight to this deliciously easy baked brie recipe, just scroll right on down to the bottom of the page where you can find the printable recipe card! Remember last week? 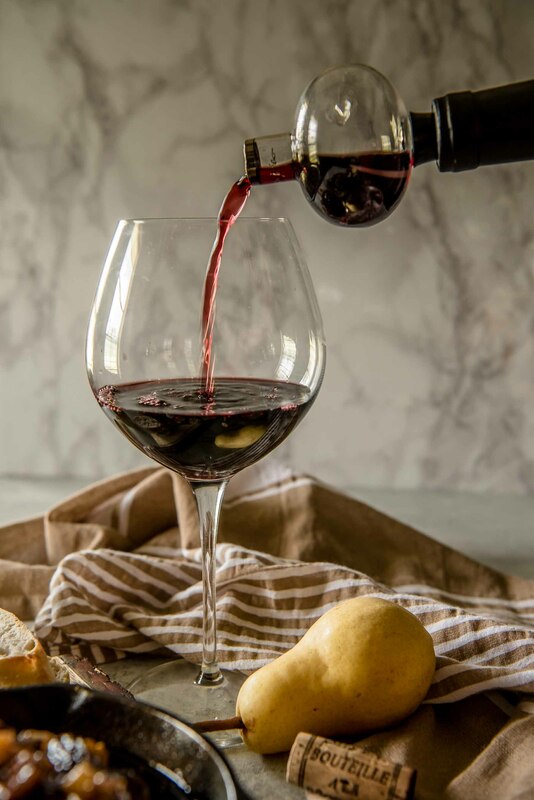 I got a box of happy in the mail and, after taste testing all 5 bottles, shared a bit about Garnacha/Grenache wines and how to pair them with just about anything. Of course, I could have just plowed through them, a few swigs at a time, jotting down notes and slowly getting drunk. But…I oddly wanted something “fancy” to enjoy them with. When I think wine and celebrations, I can’t help but think of cheese. While picking up goodies for my Bestie’s birthday charcuterie board last week, I grabbed a brie wheel on a whim. I mean, it’s never a bad idea to have brie on hand for surprise guests, right? I did end up with a surprise guest while I was shooting the video for this recipe – my grandfather. It was a nice afternoon. Grandpa kept me company while I cooked up a compote-like topping with the last of the season’s fresh figs, a farmer’s market pear, pecans for crunch, and (actually accidental) brown butter. He did decide to leave before the finished product came out of the oven though…before I could playfully offer him the first bite. Get this: ever since he was a kid, and he found out my Nana (his mother) was sneaking cheese into her meatballs, he’s hated cheese. Every kind of cheese. Except on pizza, and he keeps that to a minimum. Hate cheese. That’s a language I can’t even comprehend. Brie might never take home any first place medals for me, but I can make delicious seasonal exceptions. Especially when they look as pretty and comforting as this does. LOOKING FOR MORE CHEESE APPETIZER RECIPES? 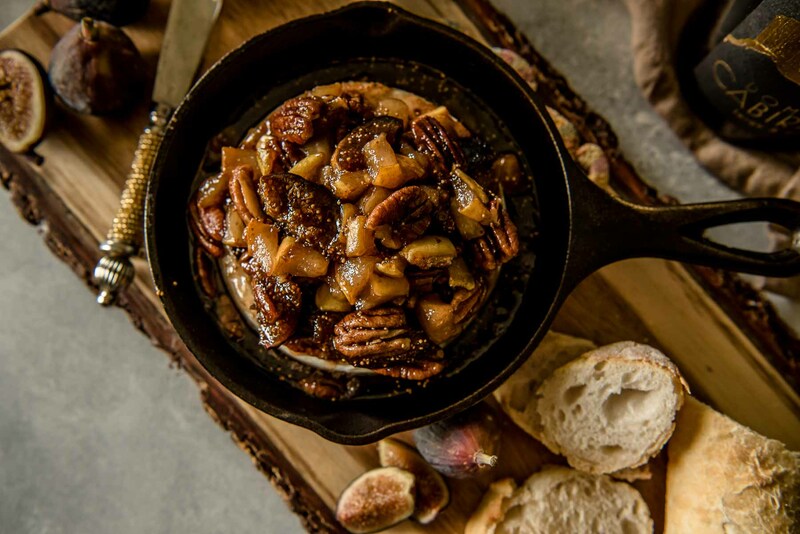 Preheat oven to 325 degrees F. Place unwrapped brie round in a 5-inch cast iron skillet or brie baker. Place on a baking sheet and set aside. Set a heavy-bottomed pan over medium-low heat. Add the butter and allow it to melt. Gently swirl the butter as it goes through two stages - popping & crackling as the water boils out, and the browning of the butter solids. As the solids begin to brown, use a spoon to peek through the foam for the light brown flecks inside - it will start to smell nutty and delicious. The whole process from solid stick to brown butter will take about 10 minutes. Quickly add figs, chopped pear, and brown sugar. Stir until sugar is melted and well combined. Simmer for 2-3 minutes, then add vanilla and pecans. Stir until well coated, then remove from heat. Pour mixture over the brie. Bake for 10-15 minutes until brie is warm and softened. Serve with baguette slices and/or crackers. 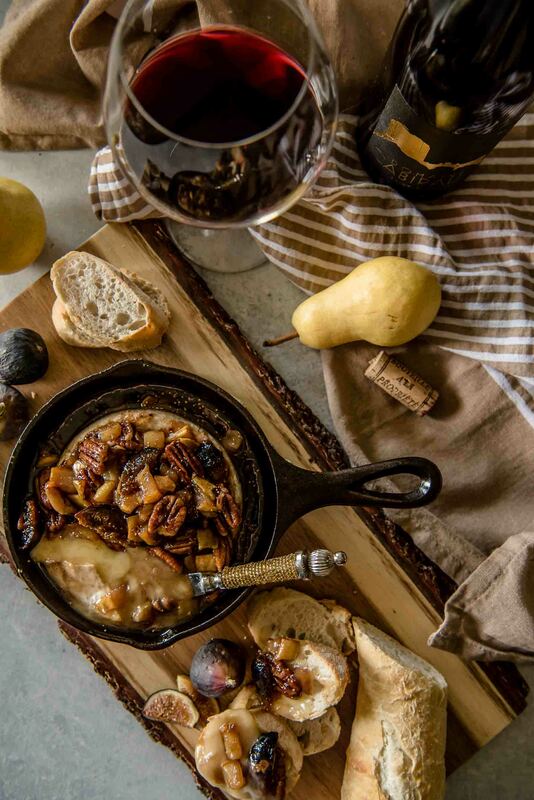 PIN THIS BAKED BRIE RECIPE FOR LATER! Looks delicious!! Thanks for sharing!!! What a stunning appetizer! I can’t wait to try it! This looks amazing! I have to try this recipe soon! This looks seriously amazing. I’m going to be watching the markets for fresh figs so that I can make this asap! Question: Can I use the semi-dried figs from Sunmaid?